We use Trend Micro Deep Security 9.1 in our environment providing agentless anti malware protection for our XenApp VMs. The Deep Security Virtual Appliances provides the real time scanning via the vShield Endpoint API using a custom XenApp policy that includes all the Anti Virus best practices for Citrix XenApp and Citrix PVS. Citrix XenApp anti-malware policy: Real Time Scanning enabled with all the best practice directory, file and extension exclusions set as well as the recommendation to disable Network Directory Scan and only scan files on Write. Deep Security Virtual Appliance (DSVA): Deployed with the default settings: 2vCPU, 2GB RAM, no CPU reservation and a 2 GB memory reservation. Shown below is a LoginVSI 150 user test with a medium (no Flash) workload on a single B200 M2 running 6x VMs with 4vCPU and 12GB RAM each with agentless protection disabled. The image below shows a VSImax score of 105, which is very similar to our current real user load per blade. Shown below is the same 150 user test with a medium (No Flash) workload on a single B200 M2 running 6x VMs with 4vCPU and 12GB RAM each with agentless anti malware protection enabled. The image below shows a VSImax score of 101. The impact on VSImax with Deep Security agentless protection enabled is only 4 users per blade which is only a 3.8% user penalty. 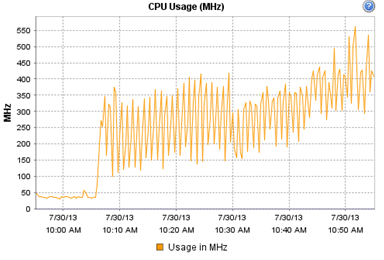 Shown below is the CPU MHz usage of the DSVA during the LoginVSI test. CPU MHz peaks at 550MHz which is 1.3% of the total available MHz of the host (39888MHz). An acceptable penalty to keep our security boys happy!